Ukraine’s emergency services battling the wildfire in Chernobyl have claimed almost complete victory, but people are extremely wary. Moreover, a much more serious potential disaster could be in the making: the spread of radioactive fumes. “Firefighters are liquidating the last of the hotbeds,” a statement said as of 9:00 am on Friday, adding that some work remains at three separate smoldering spots. A radiological lab is on site performing tests. A check is reportedly carried out automatically every three hours by 39 automated testing posts, the statement from the State Emergency Service of Ukraine also reads. 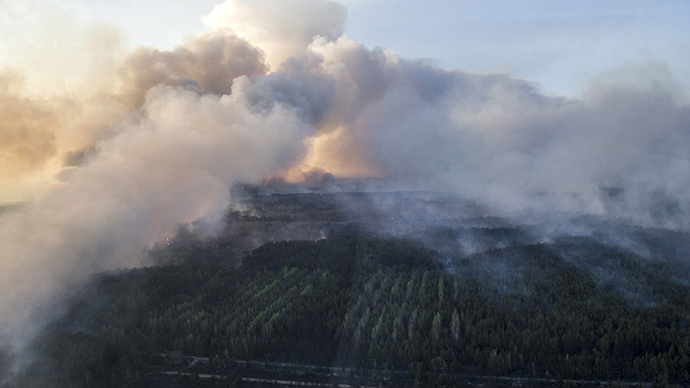 Most of the 400-hectare forest had been engulfed by the flames. The closest point to the abandoned Chernobyl reactor is only about 20km (about 12.5 miles), inside the exclusion zone, abandoned and cordoned off almost 30 years ago, when the worst disaster of its kind struck. It started on Tuesday and triggered an emergency alert, with police and the National Guard mobilized to bring the flames under control. “No increase in radioactivity has been registered” in the area outside the factory complex ‘Chernobylskaya Pushcha’, the statement adds, issuing non-alarming radiation readings from other areas including Kiev. But not everyone’s doubts have been dispelled. Greenpeace and a host of experts in the field are ringing alarm bells: “The amount of radioactivity potentially released from wildfires could be the equivalent of a major nuclear accident,” it told Govorit Moskva radio shortly after the situation became started. The potential danger in this fire comes from the radioactive contaminants the burning plants have absorbed, ecologist Christopher Busby told RT. “Some of the materials that were contaminating that area would have been incorporated into the woods. In other words, they land on the ground in 1986 and they get absorbed into the trees and all the biosphere. And when it burns, they just become re-suspended. It's like Chernobyl all over again." Busby is the scientific secretary of the European Committee on Radiation Risks. Numerous other experts in the field share these concerns. Randall Thompson warns: “If it rains on that cloud of smoke… once it gets inside you in any way – nose, mouth, hands, through your orifices – then you are being radiated.” Thompson participated in the cleanup of the 1979 Three Mile Island Incident in Pennsylvania – a partial nuclear meltdown at a nuclear reactor, the worst such accident in US power plant history. The Ukrainian government has been going back and forth with statements. Official updates were posted online by the Interior Minister and later the prime minister. “First of all, I’d like to calm everyone down. Everything is under control, the fire is 23km away from the plant. Our emergencies ministry is working at its best to prevent the spread of the blaze,” the PM told journalists on Tuesday evening. But local residents, who endured the panic before the 1986 catastrophe at the Chernobyl plant, have their doubts. One resident, Olga, tells RT that if smoke is in the air and in close proximity to the reactor, there’s no doubt people are breathing in radioactive waste. Nearly 30 years ago, an explosion and fire in Chernobyl's Reactor 4 caused a release of radioactive particles into the air, which contaminated the surrounding area and caused an increase in radiation levels in Russia, Ukraine, Belarus and across Europe. It was the worst ever nuclear disaster in terms of casualties and clean-up costs. The crippled reactor itself was sealed under a sarcophagus of reinforced concrete. But in the initial hours of that crisis, authorities moved to reassure the nation. Popov was one of 800,000 people who risked their lives so that others could live. Of the above number, 25,000 were lost.